Place melted butter in a large bowl. Add crackers and gently toss ensuring that each cracker is coated. 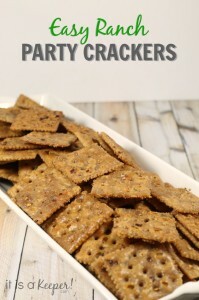 Spread crackers in an even layer on a rimmed baking sheet. In a small bowl, combine Ranch salad dressing mix and red pepper flakes; stir to combine. Sprinkle dressing mixture over crackers ensuring that each cracker is coated.